Pursuing our discovery of El Hierro, we met again the students of Montpellier whose study trip, co-financed by the association Planet in Common, aims at studying the original solutions developed by the inhabitants of this island to cope with their environment. This island features an unusual choice of a respectful development of the inhabitants and the environment. Opposite to the mass tourism that characterizes Tenerife and Gran Canaria, El Hierro preferred an economy of farming and fishing, offering essentially to the tourist breath-taking landscapes and exceptional diving sites. El Hierro is the first, and today the only one, territory having reached energetic self-sufficiency. Taking advantage of the characteristics of the island – constant trade winds and mountainous terrain – a hydro-wind plant is capable of supplying 11,5 MW, while the consumption of the population is of the order of 5 to 7 MW. This factory cunningly combines established technologies in order to mitigate the lack of steadiness of renewable energies: when the wind blows, five wind turbines of 2,3 MW each produce more energy than the island could consume. 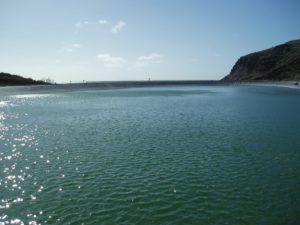 The surplus serves to pump water into a reservoir located 700 m higher. When the wind drops, this water feeds turbines as a classical hydroelectric station. So, only during lasting trade winds weaknesses there is a need for a complementary thermal power plant. A study was launched to complement wind energy by solar and geothermal energies to reach complete year-round autonomy. 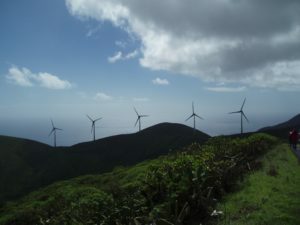 Currently, the plant generates substantial revenues that are re-invested in the environmental protection of the island. An example to be followed?